First of all, this Victoria Day weekend, I would like to apologize to the nations of the world, for Nickelback. You forgave us for Celine, you forgave us for Bryan Adams, do we get three strikes? the only thing that could make me feel worse about my life would be to play bass for nickelback. — Mike Jackson, actor, “Trevor” on Trailer Park Boys. As if Nickelback weren’t bad enough on their own, here comes Mutt Lange to “polish” their sound! The result is an album that — guess what! — sounds like a cross between Nickelback and Def Leppard. Don’t believe me? Check out those “HEY”‘s on “Shakin’ Hands”. Lifted straight out of “Pour Some Sugar On Me”, but without the sugar. This is more like aspartame. In fact this is one of the least fun album about beer and chicks that I’ve ever heard. Kroeger’s overwrought, over-serious singing style makes this one tedious listen. I’ve never heard a “party” band take themselves so seriously before. Even Metallica don’t take themselves this seriously. The lyr-yucks are a nauseating mix of cliche after cliche, stripper after stripper, beer after beer. But without a wink and a smile, like David Lee Roth used to do. This time, nobody’s laughing. 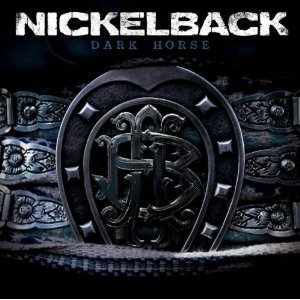 There’s a reason Nickelback are hated by millions and got rocks thrown at them in Greece. This album boils it all down into one handy package for you to piss on. My favourite thing about Chad Kroeger is how dumb he sounds when he’s trying to sound smart! Don’t blame Nickelback…you can blame me. I not only wrote Pour Some Sugar On Me, but Nickelback was my project from beginning to end. Ryan Peake (not his real name) was first to be tapped by me to be in the band. The whole idea behind the band was a quasi Def Leppard, but it was my project and one I could control the sound and the songs since I was writing them. Back in the day, members of Def Leppard b!tched when I continued to write “ballads” for them. If they hated it so much, they should have just let Mutt Lange continue to write their songs. I had fun making up the song “Something in your Mouth”. It was inspired by a blonde groupie with her face buried in Joe Elliott’s crotch when I walked into the dressing room one day. I loved to make fun of the groupies.